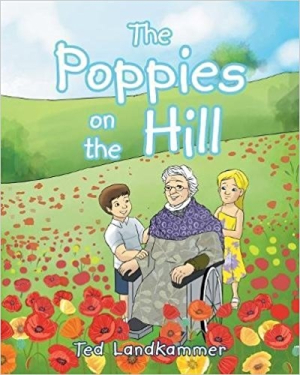 The Poppies on the Hill is a heartfelt picture book that tenderly addresses human life cycles. Ted Landkammer’s picture book The Poppies on the Hill is a bittersweet tale of intergenerational friendship. When Sarah’s family moves to a small town, the nine-year-old finds comfort and companionship with her ninety-three-year-old neighbor, Granny Brannigan. Granny greets the local schoolchildren with chocolate cookies after school each day. She also gives Sarah poppy seeds to plant on the hill; they grow in time with Sarah’s growth and become an ongoing tribute to Granny when she’s gone. The appropriately paced story focuses on how Sarah learns empathy for Granny, who is older and requires help. The book finds Sarah coming to Granny’s aid more than once. Quick strokes capture Sarah’s girlhood. She progresses from a carefree girl who dresses up in her mother’s clothes into a deliberately compassionate person who checks up on and cares for her neighbor. Empoweringly, Sarah is rendered with a measure of independence. She is free to visit Granny and run simple errands, like making tea or putting logs on the fire. When the job’s too big, she calls for backup. Heavy themes of loss and disability are tackled with grace. Attractively illustrated, the book makes use of appropriately somber colors, including muted shades of red, orange, white, and purple for its flowers. Its figures have a nostalgic quality. Pages of text are set against a sky-blue background.